Potty Training / How to: Potty train your little one! How to: Potty train your little one! Time to say goodbye to diapers? Before you even buy your toddler a potty seat, it’s important to have a plan for the training process. Find out about two methods that may help you decide how to start this important task! Remember that there’s no single, guaranteed method for success in potty training. The key is to choose the strategy that best adapts to your child and you. We have listed some methods with their pros and cons. Check them out! The main focus of this method is that your child sets the pace of training, so the actual age is less important than your child’s developmental readiness. When the child is ready, parents can begin a series of ‘successive approximations’ leading up to successful potty use. Ready? The first step is taking your child to pick out his own potty. He will love picking out his favorite color and will begin to have a sense of ownership over it. The next step is encouraging your child to sit, fully clothed, on the potty. He will begin to connect the potty with going to the bathroom. To encourage your little one to go, you can let him run around the house without diapers and leave the potty chair out in a visible place. The goal is to let him believe that potty training was his idea, not yours. For the next steps, like emptying the potty chair into the toilet, flushing, and hand washing, you have to wait until your child shows interest in them. This method is recommended by the American Academy of Pediatrics (AAP) and is the most used method in the United States today. It’s very easy follow in a busy lifestyle. It needs very little preparation or planning. It’s not a large commitment on time or consistency. This process can take weeks, depending on the child. For more information on Brazelton’s method look for these books: “Toilet Training: The Brazelton Way”, “The AAP’s Guide to Toilet Training”, and “The AAP’s The Baby Book” by William and Martha Sears. This method is based on the notion that children learn by example. Actually, the “one day” is referred more to the day you spend with your little one practicing how to properly use the potty. After this initial ‘first day’ you will spend a few days following up and trying to avoid little accidents. 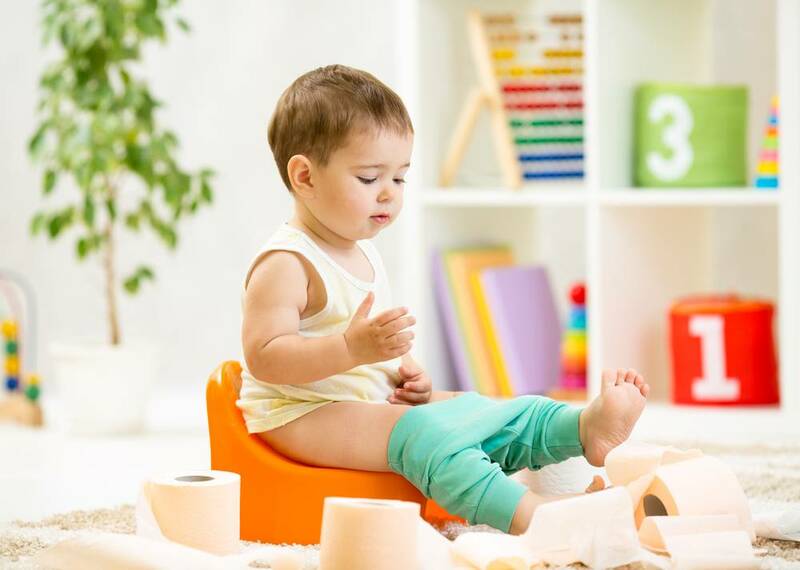 Before you start, you will need to set up a training area with a potty chair, a doll with a removable diaper (experts suggest to use a doll that can drink and “urinate”), food treats, and drinks. Remember you will need to devote a day to training (4-6 continuous hours). Ready? Use the doll to demonstrate the potty routine. Give her a drink and then tell your baby that the doll has to pee. Guide him through the process of removing the doll’s diaper, sitting the doll on the potty, waiting for the doll to pee, and praising and rewarding the doll for doing so. Then check the doll’s diaper. If the diaper is dry, the doll gets another reward. If it’s wet, you explain that big kids don’t wet their pants. Repeat this exercise several times until your child understands the steps (this usually takes no more than one hour). Now, it’s time to try what you exemplified with the doll, with him. The key to this potty training method is positive reinforcement and overcorrection. When kids get it right, they are rewarded. When they get it wrong (wet their pants) they perform practice drills. It’s quick, typically can be done in under 2 weeks. It can work for children with special needs. Scientific studies suggest that most parents who attempt fast-track potty training techniques will be successful. Once you decided on a method, talk to your pediatrician or daycare support about it; they’ll probably have plenty of experience and advice to share. And be sure you and everyone else who takes care of your child sticks to it! There are many more methods and techniques for potty training your little one. We’ll list how others work and their pros and cons on our next article, so stay tuned!